1. What is coronary angioplasty? The coronary angioplasty (PTCA) is a medical technology to change the diameter of a vessel, usually arterial. 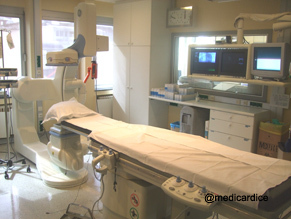 It is used to give coronary arteries narrowed by disease, sufficient size for efficient circulation, without surgery. The doctor uses small inflatable balloons, which can dilate the artery at the site of narrowing. It overwrites the lesion in the artery of the heart (atherosclerotic plaque) with a small balloon that inflates to a very high pressure. 2. What are the indications? Angioplasty is used to treat occlusions or arterial stenosis, but the coronary angioplasty may be performed after display of the coronary arteries by coronary angiography. Either angioplasty is immediately performed after the coronary angiography during a single session (lasting approximately 60 minutes). 3. How is the test done? An intravenous infusion is set up. An anticoagulant (heparin) and platelet anti-aggregation is administered to patients (aspirin, clopidogrel). The doctor administers a local anesthesia by injection under the skin in the area where the catheter must be inserted (the fold of the groin, arm or forearm). It injects the femoral artery (if the insertion is in the fold of the groin) or brachial artery (if the insertion is in the arm) or the radial artery (if the insertion is at of the forearm) and sets up the introducer. The cardiologist inserts the catheter guide in the introduction sheath and brings it into the aorta to the coronary arteries. The doctor controls visually the exam by fluoroscopy. When the catheter is well positioned, the doctor does an injection of contrast iodine to observe the shrinkage. A guide mounted inside the catheter is inserted into the artery until its tip is beyond the narrowing. The angioplasty catheter-balloon is placed in the artery at the level of the shrinkage using the guide. Once in place, the balloon is inflated under high pressure. When the plaque is compressed and the artery is sufficiently opened, the doctor deflates the catheter-balloon and removes it after. By taking new radiographs of the artery, the doctor observes the improvement of the blood flow. To optimize the angiographic result, a stent mounted on an angioplasty catheter is inserted into the coronary artery, using the guide. Once in place, the balloon is inflated under high pressure in front of the obstacle to implement the stent against the walls of the artery. When the artery is sufficiently opened, the doctor deflates the catheter-balloon and removes it after. He produces new X-ray of the artery to analyze the final outcome. The Catheters are removed (guide catheter, angioplasty catheter and guide). The introducer is also removed. After a femoral approach, hemostasis is performed with a material that can seal the drain hole in the artery (Angioseal, Perclose). After a radial approach, hemostasis is performed with a material that compress the radial artery (TR Band).The patient can return to his room. The mobilization of the patients can be done earlier (2 hour after) after a femoral approach when Angioseal is used. When the examination is performed by the radial approach, immediate mobilization is possible. Biological control of renal function may be done the next day. Most often, the patient can leave the hospital the day after the exam. The coronary angioplasty lasts at least thirty minutes. The exam is not painful (the only unpleasant part can be the local anesthesia). It may be uncomfortable for longer lying down on a relatively hard table. Each injection of contrast may be accompanied by a brief heat sensation.